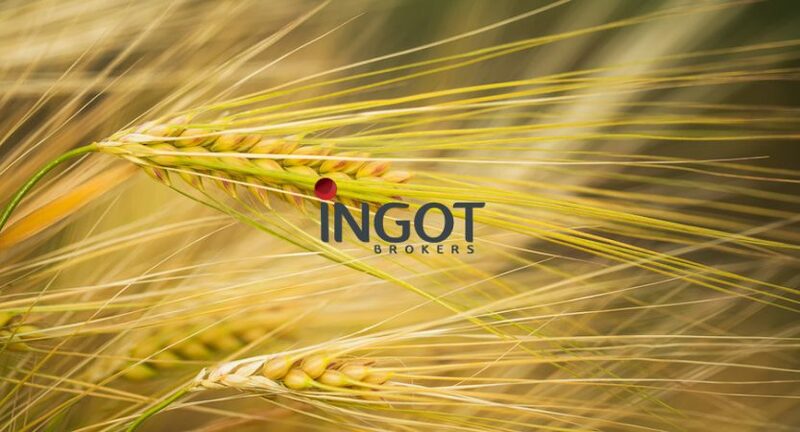 Home » Commodities » Grain commodity futures’ ended Thursday’s session in the red territories, as Corn and Wheat prices fell significantly after USDA’s export report on Thursday morning. Grain commodity futures’ ended Thursday’s session in the red territories, as Corn and Wheat prices fell significantly after USDA’s export report on Thursday morning, while Soybean price was down moderately. On the energy front, WTI Oil prices rose on Thursday’s session to close at 66.95 USD per barrel and currently trading slightly lower after Saudi Arabia warned of oversupply to trade at 66.65 USD per barrel at 7:20 GMT. Moreover, Brent Oil gained on Thursday to close at 76.55 USD a barrel but currently trading lower at 76.28 USD per barrel at 7:20 GMT. CBOT Wheat December futures traded lower on Thursday’s trading session due to weak export and supply data. Wheat futures ended the session at 4.86-1/2 USD per bushel, and currently trading higher at 4.92-3/4 USD per bushel at 7:20 GMT. Wheat exports shipments fell by 19 percent from the prior week which totaled 14.7 million bushels, and it came 11 percent below the four-week average. In Europe, the European Commission has downgraded its estimates for the European Union’s 2018 Soft Wheat production by one percent to reach 4.681 billion bushels. Meanwhile, Taiwan has issued an international tender that closes on the first of November and for a shipment in December or January, to buy 3.7 million bushels of U.S. Milling Wheat. However, in Jordan, the country issued a new international tender to purchase 4.4 million bushels of Hard Milling Wheat, after the country made no purchases in its last international tender last week for the same amount. Initial volume estimates were higher slightly from Wednesday’s count of 114,178 CBOT contacts to read 118,168 CBOT contracts on Thursday. CBOT Corn December futures were down for the second consecutive week on Wednesday’s session due to export data. CBOT Corn futures ended the session at 3.61 USD per bushel and currently trading at 3.63 USD at 7:20 GMT. In mainland China, the country sold through an auction on Thursday around 98.2 percent of its total available for sale of Corn, which totaled 154.4 million bushels of its state reserve of Corn. The Crop Estimates Committee estimated that South Africa’s 2019 Corn acreage will advance by 6 percent year over year to reach 6.05 million acres due to the drought conditions in the country that has improved from last year. Preliminary volume predictions rose significantly ahead of Wednesday’s count of 194,770 CBOT contracts to reach 364,689 CBOT contracts on Thursday. CBOT Soybean November futures traded lower on Thursday’s trading session to finish at 8.42-1/2 USD per bushel due to another bearish USDA export data. Soybean futures’ currently trading lower at 8.43-3/4 USD per bushel at 7:20 GMT. Meanwhile, South Korea issued an international tender that closes on Friday to buy 60,000 metric tons of Soymeal from optional origins that are expected to arrive next May. Initial volume estimates moved significantly lower from Wednesday’s final count of 371,715 CBOT contracts to reach 251,032 contracts on Thursday.